Like many of our favorite desserts, these No Bake Chocolate Peanut Butter Crunch Bars start with chocolate and peanut butter. Chocolate + Peanut Butter + plenty of crunch = pure happiness in a homemade “candy bar” that you make in about 5 minutes! I am so excited to share these No Bake Chocolate Peanut Butter Crunch Bars with you today and I’m more than a little excited to be sharing a super quick 30-second video too! 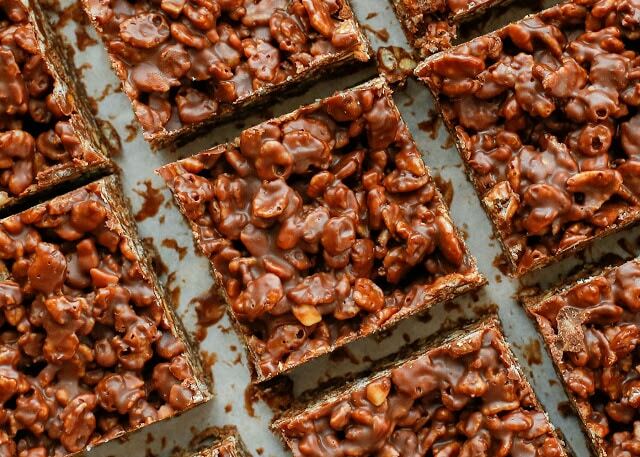 I’ve made countless versions of no-bake bars over the years, but it always comes back to chocolate, peanut butter, and crunchy cereal. These bars remind me of Nestle Crunch and Hershey’s Krackel candy bars, but oh so much tastier! Reason number one why they’re better? probably because I can make them with the darkest chocolate I have in the house. I also love that my version has more crunch too. I like to make these No-Bake Chocolate Peanut Butter Crunch Bars with dark chocolate, but semi-sweet chocolate works great too. If you’re a fan of milk chocolate, make these with your favorite milk chocolate chips. I usually cut these bars into tiny bite-size candies, about 1-inch square. The bars are easier to eat that way and I’m not tempted to eat a whole “candy bar” when I want a sweet treat. I live in a warm climate, so I can tell you that these bars will keep nicely in the refrigerator for at least a week. (Truthfully, they’ve never lasted that long in my house.) However, if you live in a cooler area, this should be fine at room temperature. 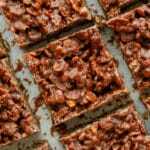 For more no-bake candies and fudge recipes, check out the very popular Sea Salt Pecan Toffee, Creamy Peanut Butter Fudge, and Fruit and Nut Chocolate Bark. This Reese’s Peanut Butter Fudge and this Copycat See’s Fudge are both on my can’t-wait-to-try-it list this year as well. Love this recipe? PIN IT to your DESSERT BOARD to save it! Follow BAREFEET IN THE KITCHEN on Pinterest for more great recipes! Kitchen Tip: I use these bowls and this spatula to make this recipe. Line an 8x8 pan with parchment. Combine the peanut butter, honey, butter, and chocolate chips in a large glass bowl. Microwave 90 seconds at full power. Stir until smooth. Add the cereal and stir until well combined. Scoop the chocolate mixture into the pan and spread across the pan. Place in the refrigerator until firm, at least an hour. Use the edge of the parchment to lift the bars from the pan. Slice into bars. Store in an airtight container in the refrigerator for up to two weeks. Enjoy! This recipe also works well with coconut oil in place of butter. The parchment paper isn’t required for this recipe, but it will make it easier to remove the bars from the pan. Oh my!!!!! Checked out the recipe. YUM. I have to buy the rice cereal. So on my to-do-list. Leave out the honey, it is sweet without it and who needs the extra calories.. Same with the butter, 2 tablespoons is plenty and coconut oil is a great substitute. Use any crunchy cereal you have on hand, cornflakes, Kashi mix, etc. I used cornflakes and adde d a few peanuts I had on hand. Great snack but be forewarned, it's hard not to eat the whole pan! Can't wait to try these recepes they looks so good and my favorite ways to do them...very sample! keep them coming in i will be looking for them....tyvm...Rina ..